Do you have a toilet that often seems to drip, drip and drip? This is one of the most common problems that homeowners run into especially in older homes. 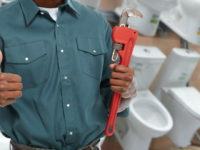 Toilet repair is the most common and important plumbing services that you can seek this winter. Let’s face it: no homeowner wants to deal with a clogged toilet. It’s messy, gross, and altogether unsanitary. It’s particularly unhygienic if that clog causes an overflow, which can send plenty of water around the surrounding area. It may create serious water damage to the flooring and may cost you thousands of dollars to have it restored. If toilet clogs continue for a longer period, it may result in various problems that include: repair or replacement costs to the flooring, repairs to drain and sewer lines, higher water bills, etc. 1. Have an Alternate Garbage Disposal System in the Bathroom: Always keep a trash box in the bathroom to dispose of the bathroom waste material. It will prevent the future toilet clogs as the occupants have an alternate option to discard any material that would have otherwise gone into the toilet. 2. Try to Keep the Surfaces Clear: The nearby counters and the areas around the toilet should be kept clear to avoid any accident wherein the object is knocked into the toilet accidentally. 3. Use of Plunger Properly: Every homeowner should know how use a plunger in the bathroom. It proves to be of incredible help for any last-minute clogs. Or else get in touch with a local licensed plumber if you think the clog cannot be removed without their help. 4. Flush Twice, Only when required: If you see the waste is not going then flush it the second time you never know if the waste goes down after the first flush. However, if you have to flush a second time more often, then it may indicate a problem with the toilet requiring a repair. As multiple flushes are a waste of water and the pressure of one flush should be enough. 5. Know When to Call a Plumber: When you are in doubt, leave it up to the pros. Some homeowners try to fix problems on their own which instead result in bringing more damage to the toilet bowl in the process. If the toilet clog problem persists again and again get in touch with licensed plumbers who can inspect the problem and fix it. A clogged toilet can be incredibly frustrating and messy. When it comes to toilet problems, Toilet Repair in Brooklyn, our licensed plumbers have been dealing with toilets in homes across the local area for years. Our licensed plumbers can bail you out of trouble in no time and eradicate any toilet clog before it turns into something terrible.